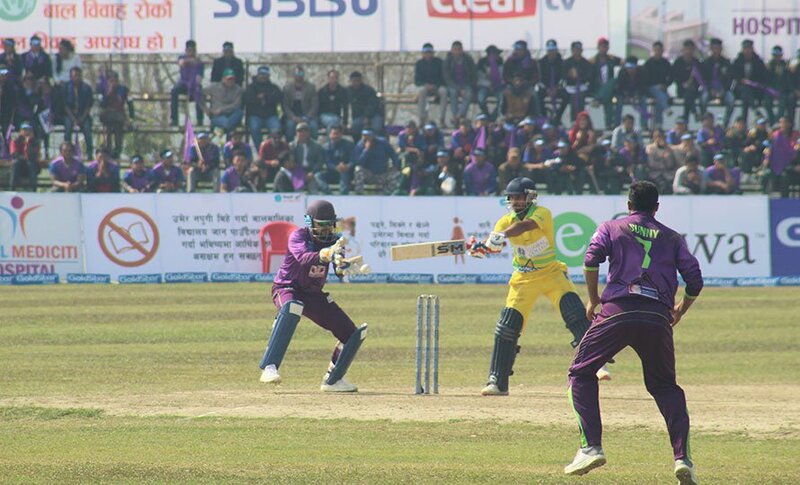 The match between CYC Attariya and Dhangadhi Stars during the third edition of DPL, on Tuesday, February 12, 2019. Hosts Dhangadhi Stars led by Sompal Kami lost their second match of the Dhangadhi Premier League 3 to CYC Attariya led by Dipendra Singh Airee by five runs. They had lost their first match to Kathmandu Goldens by four wickets on Monday. Attariya had posted a meagre target of 96 runs to Dhangadhi, but they could score only 90 runs in 20 overs at the loss of nine wickets. The hosts had hoped that Raju Rijal would score a six to take the team to victory in the last ball, but in vain. Earlier, he had scored a four and another six in the first and third balls of the final run. Rijal scored 26 runs in total. UAE’s Rohan Mustafa scored 18 runs for the team. On the opponent side, Bhuwan Karki’s contribution was significant as he took four wickets, followed by two wickets by Sunny Patel. In the first innings, Attariya won the toss and elected to bat. They scored 95 runs at the loss of five wickets. Patel made the highest of 35 runs in the innings.